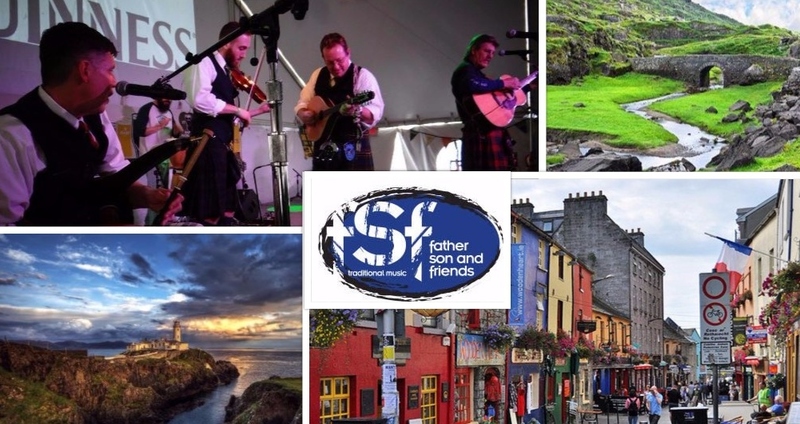 Join Father Son and Friends and explore the southern coast of Ireland as we look for seaside shanties and rowdy pubs and so much more. There will be plenty of time to travel and see the sites or relax and enjoy local Irish life. -9 nights accommodations in some of the most sought-after locations. -Airfare roundtrip from Dayton International airport. Other airports available upon request. -Transportation to all scheduled group outings. $300 deposit per person holds your reservation. Affordable monthly payments available. July 10 - Day 0 - Fly from Dayton to a major US airport. Dinner and breakfast served on the flight. July 11 - Day 1 - Land in Shannon, Ireland and meet our private coach driver/guide. Enjoy a brief tour of Shannon then off to the Cliffs of Moher and the Burrens. Take a ferry out to get a breath-taking view only seen from the sea. Lunch on your own at the visitor's center. Then it is in to Galway for a city tour. We will have a Welcome dinner in the evening. July 12 - Day 2 - After a hearty Irish breakfast, you have some options. Spend the day exploring Galway or take in a full day of Galway Fringe Festival. Lunch and dinner on your own. July 13 - Day 3 - After breakfast, we travel south toward Limerick. We will have some exploring time. This is a compact city on the Shannon River. Plenty of food, pubs, shopping, and medieval architecture. We will travel on through Southern Ireland country and end the evening in Waterford. Lunch and dinner on your own. July 14 - Day 4 - In the morning, after breakfast, we will tour Waterford Crystal seeing the fine crystal and international trophies they are known for. We will tour the nearby Famine Ship and get the full experience of the conditions during the great migration to the US. Also nearby is the Waterford Medieval Treasures Museum. Or it could be an optional day to explore Waterford at your own pace. Lunch and dinner on your own. July 15 - Day 5 - After breakfast, we say goodbye to Waterford and head towards Cork. Along the way we will stop at the famous Blarney Castle and visit the famous Blarney Woolen Mills. Our driver/guide will give us a city tour before we check into our hotel in Cork and spend the evening exploring the pubs. July 16 - Day 6 - After breakfast we will have some free time to explore Cork. After lunch on your own, we travel on along the southern coast with scenic stops along the way. Our stop that evening will be in the village of Killarney, nestled at the base of Killarney National Park. July 19 - Day 9 - Return to Shannon. Celebrate a great trip with a farewell banquet at Bunratty Castle after visiting Heritage Village Park or nearby Durty Nellie's Pub. Some fine print: DarlaTours is not responsible for any loss or damages of property or for injuries incurred by passengers, nor for delays caused by situations beyond our control, including natural disasters, riots, strikes, non-participation or other events that could affect the tour. We highly recommend travel insurance which guest purchase independently. We reserve the right to cancel any tour at our discretion, at which time full refunds are made, which releases DarlaTours from any future obligation. Guests registering for any tour are fully responsible for any arrangements, such as air or added hotel nights that they may have booked on their own, regardless of whether the tour group changes the itinerary or tour dates or cancels the tour. The exact scheduling and scope of events, hotels, meals, group leaders and guest hosts during any tour is subject to change. Persons registering for the tour agree to these terms as indicated on the registration form.